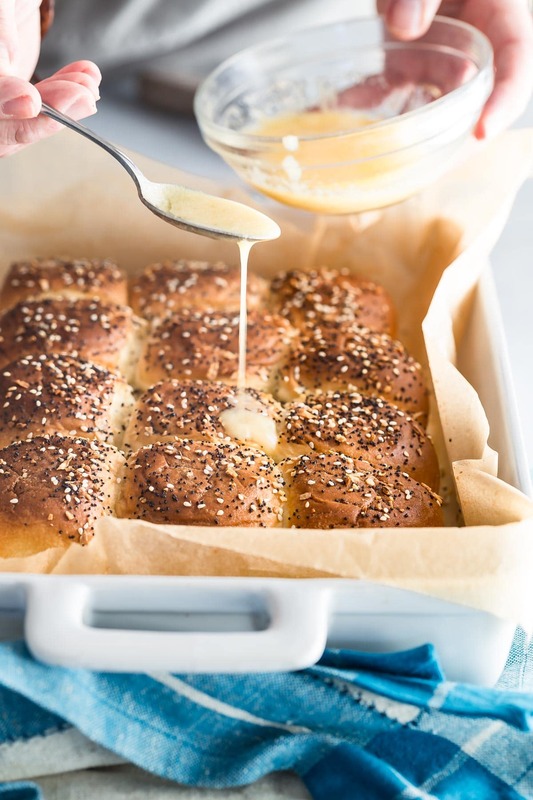 Easy Hawaiian bun pull apart sliders filled with melted swiss cheese, corned beef, sauerkraut and covered in honey Dijon butter. I’m pretty sure you’ll be having some kind of St Patrick’s Day celebration next month, right? If you’re like me, leftover corned beef is a sure thing. 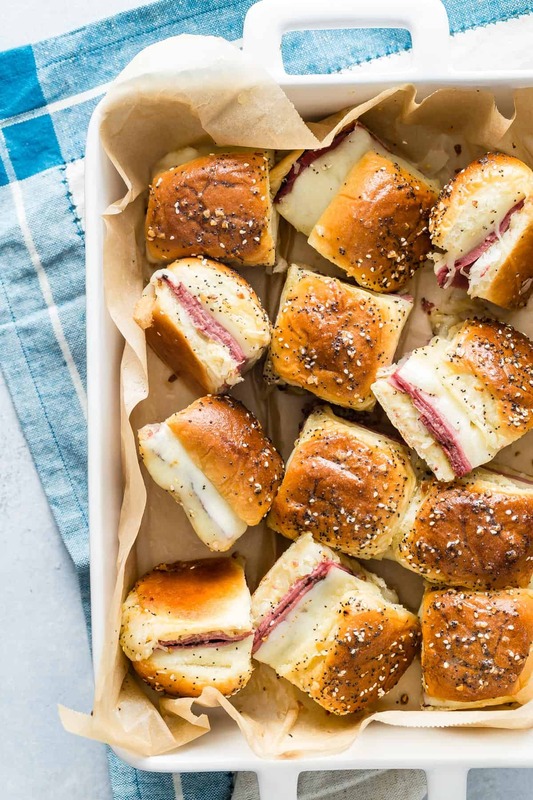 Sandwiches for days I say, but I have never tasted awesome corned beef sandwiches until these Cheesy Corned Beef Pull Apart Sliders! First the bun, Hawaiian sweet bread is everything and perfect for this recipe. You can bash out 12 sliders in five minutes but you better have another batch ready to go because these will go fast! 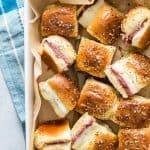 Pull apart sliders are super popular and I was amazed at what people fill them with. Cheeseburger sliders, Philly Cheesesteak style and even pizza sliders are a just a few options for you. Now I have a million ideas for my next batch, they’re easy to make and can feed a small army in a heartbeat. No slider would be a true pull apart without some kind of crazy butter topping. I whisked up some melted butter, Dijon mustard, honey and garlic and literally dowsed the buns before baking them. You’re going to think I’m nuts and the bread is just going to fall apart but it actually soaks all of the butter up. When they come out of the oven give them another butter brush for that shiny sheen! If you can’t find premixed everything bagel seed, check out this recipe I used for my Cheese and Ham Croissants, it’s easy to make and I’ve also seen jars of it for sale in Trader Joe’s now. 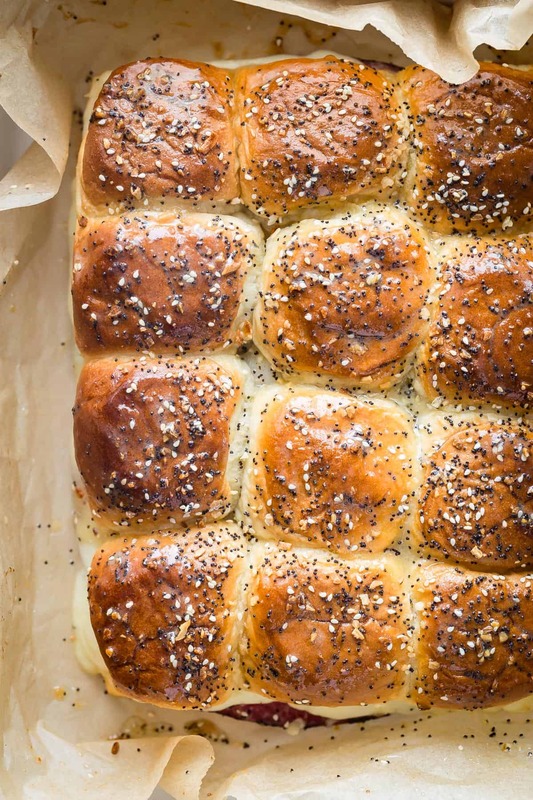 Poppy seeds would also work in a pinch. Have an awesome week friends and let me know if you have any amazing ideas for more pull apart buns! Easy Hawaiian bun sliders filled with melted swiss cheese, corned beef, sauerkraut and covered in honey Dijon butter. Preheat the oven to 350 degrees F. Line a 13x9 inch oven safe dish with parchment paper. Slice the whole slab of Hawaiian buns in half creating a top and a bottom half. Place the bottom half into the prepared dish and add the sauerkraut spreading it out evenly across the buns. Spread the Dijon over the sauerkraut. Lay each slice of the corned beef onto the buns followed by the swiss cheese. Place the top half of the slider buns on top of the cheese. Make the glaze by melting the butter and whisking in the Dijon, honey and garlic powder. Using a pastry brush, glaze the top of the slider buns with half of the melted butter mixture and then sprinkle the everything seed on top. Place in the oven and bake uncovered for 20 minutes. Once the buns come out of the oven, brush again with the remaining melted butter glaze. Lift the sliders out of the pan using the parchment paper and slice into individual sliders. Serve at once. Ah, what a great slider idea! There’s this little market near me that sells a fresh and pre-made ham & cheese version of sliders and I’m so lazy I just go and buy them instead of making them. 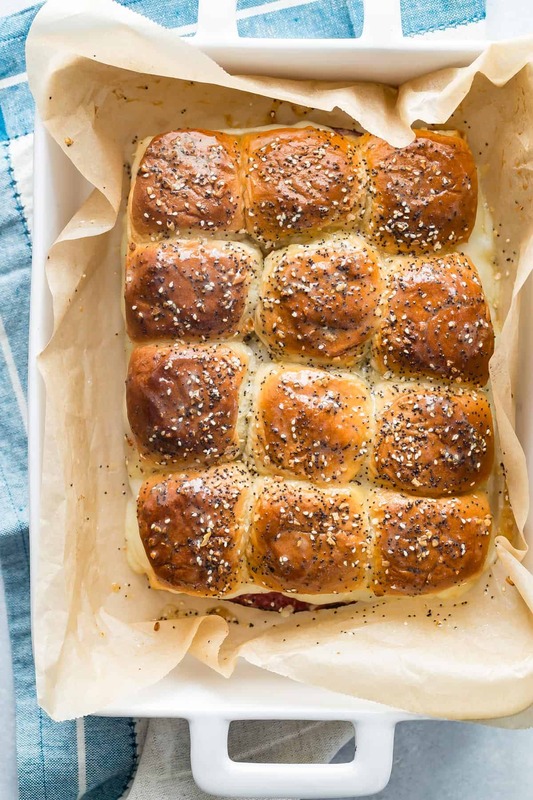 They are pretty epic, but I think I’m going to have to make my own now because… corned beef sliders!?! Yes please! Yesss! SO stinking excited that tomorrow is March, and therefore the beginning of all things St. Patty’s and corned beef. These look so good, and are the perfect party sized sammie! I got a whole corned beef and I can’t wait ot use the leftovers for THESE!! Consider them made!